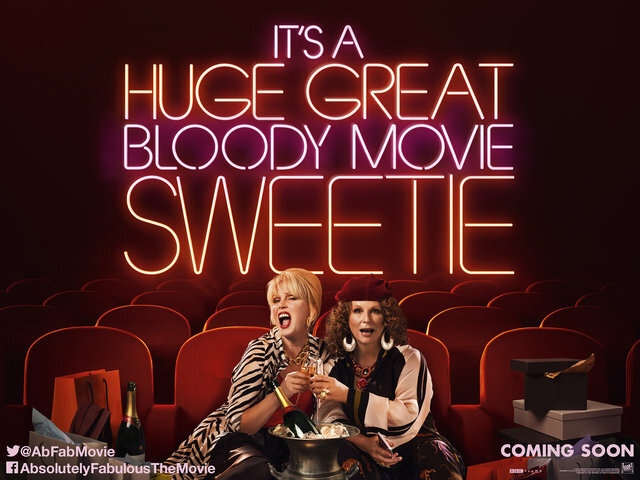 Absolutely Fabulous: The Movie reunites Jennifer Saunders and Joanna Lumley as the iconic duo Edina and Patsy. Their first big screen outing hits cinemas across the UK on 1st July, and is then released across the pond in the US on 22nd July. A brand new UK Quad poster has been released for the film which also stars the original cast, including Julia Sawalha as Saffy, Jane Horrocks as Bubble and June Whitfield as Mother. Edina and Patsy are still oozing glitz and glamour, living the high life they are accustomed to; shopping, drinking and clubbing their way around London’s trendiest hotspots. Blamed for a major incident at an uber fashionable launch party, they become entangled in a media storm and are relentlessly pursued by the paparazzi. Fleeing penniless to the glamorous playground of the super-rich, the French Riviera, they hatch a plan to make their escape permanent and live the high life forevermore!